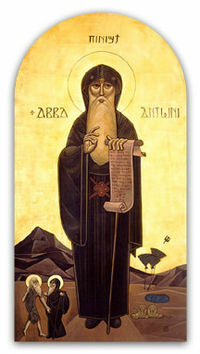 “Alhough the ascetic impulse had been present in the Christian movement from the beginning, having been articulated for example by the apostle Paul (1 Cor 7:1-7), it is no coincidence that it should have risen to prominence, in the life of monks such as Anthony, precisely at the time when the church was making its peace with the Roman Empire and with the world. Part of the price the church paid for that peace was the necessity with coming to terms with those who could not, or at any rate did not, take its message with utmost seriousness, but who were willing to go along with being Christians much as they had been willing to go along with being pagans, just as long as it did not cost them too much. Now that it was easier to be a nominal Christian than to be a nominal pagan, the multitude who began to crowd into the church were not looking to become “athletes” for Christ; but that was precisely the term that Athanasius used to describe Anthony the ascetic, who underwent rigorous training in order to be able to compete and win in Christ’s contest, against the devil, the world and the flesh….they were not fleeing from the world in every sense of the word, they were fleeing from the worldly church. …the monasticism of the fourth and fifth centuries was a protest, in the name of the authentic teaching of Jesus, against an almost inevitable by-product of the Constantanian settlement, the secularization of the church and the lowering of standards of discipleship set in the Gospels ”.